We offer select gift cards for sale via our GiftCards4Less Highest Unique Blind Bid Gift Card Auctions, where you can bid to buy gift cards for a fraction of their face value! Our GiftCards4Less Highest Unique Blind Bid Gift Card Auctions differ from traditional auctions. In a traditional auction, the goal is to place the highest overall bid. The bidder with the highest overall bid wins the auction and is able to purchase the auction item for an amount equal to his/her highest overall bid. With our GiftCards4Less Highest Unique Blind Bid Gift Card Auctions, the goal is to place the Highest Unique Bid. The bidder with the Highest Unique Bid wins the auction and is able to purchase the gift card for an amount equal to his/her Highest Unique Bid. Unique – a bid amount submitted where no other bidder has bid the exact same amount. A $ 50 Blind Bid Gift Card Auction has a Max. Bid Amount of $1. A $100 Blind Bid Gift Card Auction has a Max. Bid Amount of $2. A $250 Blind Bid Gift Card Auction has a Max. Bid Amount of $4. A $500 Blind Bid Gift Card Auction has a Max. Bid Amount of $8. For our $50 GiftCards4Less Highest Unique Blind Bid Gift Card Auctions, bidders can submit their bids equal to or less than $1 down to $0.01. For our $100 Highest Unique Blind Bid Gift Card Auctions, bidders can submit their bids equal to or less than $2 down to $0.01. For our $250 GiftCards4Less Highest Unique Blind Bid Gift Card Auctions, bidders can submit their bids equal to or less than $4 down to $0.01. And for our $500 GiftCards4Less Highest Unique Blind Bid Gift Card Auctions, bidders can submit their bids equal to or less than $8 down to $0.01. The bidder with the Highest Unique Bid (or the Highest Duplicate Bid in the event that there are no unique bids at the close of the auction -- see "Strategic Considerations" for more details) wins the auction and is able to purchase the gift card for an amount equal to his/her Highest Unique Bid! Bidders pay a Bid Fee for each bid they submit. For our $50 GiftCards4Less Highest Unique Blind Bid Gift Card Auctions, we offer a standard Bid Fee of $2/bid. For our $100, $250, and $500 GiftCards4Less Highest Unique Blind Bid Gift Card Auctions, we offer a choice of three different Bid Fee structures: $3/bid, $5/bid, or $9/bid. Strategic Considerations: The strategy of waiting to place your bids until an Auction is about to close may not necessarily be the most successful approach, particularly if there are no unique bids. If at the close of an auction every bid submitted was duplicated by one or more additional exact same bids, then there are no unique bids for that Auction. In the unlikely event that there are no unique bids at the close of the Auction, then the FIRST bidder to submit a bid closest (or equal) to the Max. Bid Amount for the Auction has the Highest Duplicate Bid and will be deemed the winner of the Auction. In this scenario, it is very important to get your bids in early, rather than waiting to submit your bids just before an Auction is about to close. You may want to keep this in mind for strategic purposes as you submit your bids. Below is a screenshot of three demo GiftCards4Less Highest Unique Blind Bid Gift Card Auctions, for purposes of illustration. Three $100 Sears gift cards are up for auction in this demo screenshot. One has a $3 Bid Fee, the second has a $5 Bid Fee, and the third has a $9 Bid Fee. Generally, a higher Bid Fee requires fewer total bids to close the Auction. The first Auction with a $3 Bid Fee requires a total of 74 bids to close the Auction. The second Auction with a $5 Bid Fee requires a total of 44 bids to close the Auction. And the third Auction with a $9 Bid Fee requires a total of 25 bids to close the Auction. Each demo practice Auction begins with a $100 "Bidding Account Balance" for use in practice bidding. Enter a bid amount, confirm your bid amount, and then click on the "submit bid" button. Notice the Max. Bid Amount for Auction ID# 129, shown below. The Max. Bid Amount listed for the Auction is the maximum amount that you can bid to purchase the gift card. Bidders can submit their bids equal to or less than the Max. Bid Amount down to $0.01 for this Auction. Below is an example of how Auction ID# 129 may look after several practice bids have been submitted. Unique Bid – A unique bid is a bid that is not identical to any other bid submitted in the Auction; a unique bid is one in which the amount bid is the only one of that value because it has not been submitted by any other bidder. Duplicate Bid – A duplicate bid is a bid that is identical to at least one other bid submitted in the Auction; a duplicate bid is one in which the amount bid is not the only one of that value because it has been sibmitted by at least one other bidder. Highest Unique Bid – The Highest Unique Bid is a bid amount that is both: (1) Highest - a bid amount submitted closest (or equal) to the Max. Bid Amount for the Auction; and (2) Unique -- a bid amount submitted where no other bidder has bid the exact same amount. Highest Duplicate Bid – The Highest Duplicate Bid will only be displayed in the event there are no unique bids in an Auction. If at the close of an Auction every bid submitted was duplicated by one or more additional exact same bids, then there are no unique bids for that Auction. In the unlikely event that there are no unique bids submitted by the close of the Auction, then the FIRST bidder of the two or more bidders who bid closest (or equal) to the Max. Bid Amount for the Auction is deemed to have the Highest Duplicate Bid and will be declared the winner of the Auction. Note: It is important to keep in mind that during an open Auction, the Highest Unique Bid may frequently change as additional bidders submit their bids. The status of a bidder's unique bid could change to a duplicate bid at any time if any other bidder bids the exact same amount. Use your Bidding History to monitor the status of your bids. If any of your unique bids become duplicate bids, then you may want to bid again before the auction closes! Bidding Assistance: The section of your Auction account titled "Bidding Breakdown For This Auction" is useful for developing a strategy in submitting successful winning bids. The Breakdown provides detailed information regarding your total unique and duplicate bids for the Auction as well as competing bidders' unique and duplicate bids for the Auction. You can use this information to develop a strategy as you submit additional bids before the Auction closes. An Auction will immediately close when the total number of bids required to close the Auction ("Bids Required to Close") is reached. The Bids Required to Close is the total number of bids submitted by bidders that must be accepted by GiftCards4Less for the Auction to close. Additionally, the Bids Required to Close is the largest number of bids that can be submitted by bidders for the Auction. In these practice auctions, the $2 Bid Fee Auction requires a total of 60 bids to close. The winning bidder at the close of an Auction is the bidder who submitted the Highest Unique Bid for the gift card out of all the bids received for the Auction. When an Auction closes, the section of your Auction account titled "Completed Auction Detail" will provide a detailed breakdown of all bids submitted prior to the close of the Auction. The Auction Detail will show: the Bid ID # for each bid submitted; the date and time each bid was submitted; the Username, city, and state of each bidder; the amount of each bid submitted; and whether the bid was a unique bid or a duplicate bid. The Auction Detail will also identify the Highest Unique Bid as the winning bid. The winning bidder will be extended an offer to purchase the gift card for an amount equal to his/her Highest Unique Bid, which is a fraction of the face value of the gift card. Once an Auction closes, the winning bidder will be extended an offer to purchase the gift card for an amount equal to his/her winning bid. The winning bidder must return to his/her Auction Account and click on the "pay winning bid amount" link in order to pay for the gift card using PayPal. In this example, assume Auction ID# 132 closed on 3/22/2009 at 1:24:15 AM ET. 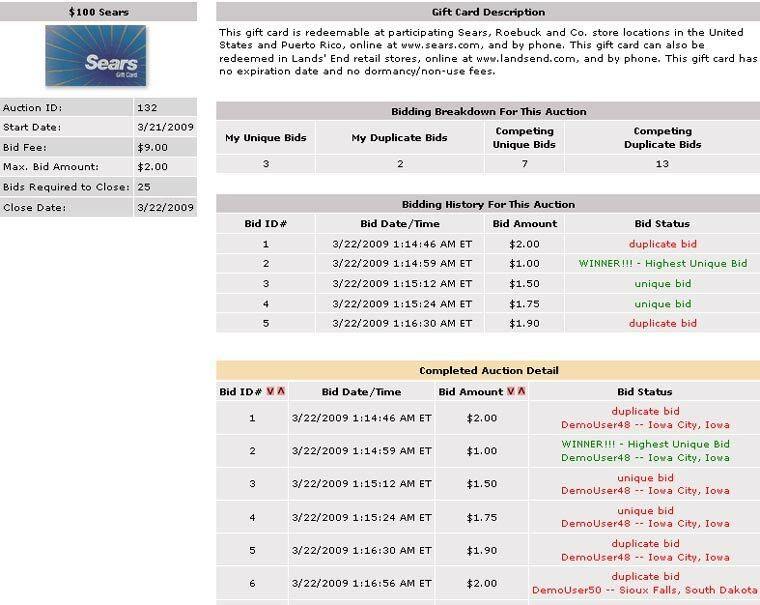 The "Winning Bid Payment Status" tells the winning bidder that he/she has 30 days from the close of the Auction to purchase the $100 Sears gift card for the $1.91 winning bid amount. Thus, the winning bidder's payment is due by 4/21/2009 at 1:24:15 AM Eastern Time. When the winning bidder clicks on the "submit" button, the winning bidder will be taken to PayPal where the winning bidder can log in to his/her PayPal account to pay the $1.91 winning bid amount for the $100 Sears gift card. After the winning bidder has successfully paid the winning bid amount, the winning bidder can log out of his/her PayPal account. Note: If there is a delay in notification from PayPal regarding the payment by the winning bidder of the $1.91 winning bid amount for the $100 Sears gift card, then the winning bidder may not immediately see the above "Winning Bidder Options" section in the winning bidder's Auction Account. If such a PayPal payment notification delay occurs, then GiftCards4Less will manually update the winning bidder's Auction Account payment status. Once the "Winning Bid Payment Status" has been properly updated to a "Paid" status, the winning bidder should see the "Winning Bidder Options" section. There are three options available to the winning bidder once he/she purchases the $100 Sears gift card for the $1.91 winning bid amount. The winning bidder will have a total of seven days to select one of the three Winning Bidder Options displayed in the winning bidder's Auction Account. If the winning bidder does not make a selection within that seven-day time frame, then the three options will be removed from the winning bidder's Auction Account and GiftCards4Less will ship the $100 Sears gift card to the winning bidder's PayPal Confirmed Shipping Address free of charge via the United States Postal Service. Important: A winning bidder can always check the status of his/her Winning Bidder Options by clicking on the "Auctions Won" link in the winning bidder's Auction Account. Option #1: The winning bidder can take delivery of his/her gift card - "I want the $100 Sears gift card." Option #2: The winning bidder can trade in his/her gift card to GiftCards4Less for almost any gift card that the winning bidder prefers - "I want to trade my $100 Sears gift card for another $100 merchant gift card for a 15% trade fee." GiftCards4Less will review the winning bidder's offer to trade. The winning bidder will have to click on the "Choose Alternate Winning Bidder Option" link in order to select another winning bidder option or specify a different preferred merchant gift card. If, as in this Sears/Costco example, GiftCards4Less is able to obtain the winning bidder's preferred gift card with a reasonable amount of effort and within a reasonable amount of time, we will accept the winning bidder's offer to trade the $100 Sears gift card for a $100 Costco gift card for a 15% trade fee. After the winning bidder pays the invoice for the 15% trade fee, GiftCards4Less will mail the $100 Costco gift card to the winning bidder's PayPal Confirmed Shipping Address free of charge via the United States Postal Service. We will ship the $100 Costco gift card within approximately 48-72 hours following receipt of the winning bidder's cleared payment. Note that this approximate 48-72 hour processing time excludes weekends and holidays. Once GiftCards4Less has mailed the $100 Costco gift card, the winning bidder's Auction Account will be updated to provide the date of the shipment and the Tracking Number for the shipment. If the winning bidder selects this option, GiftCards4Less will buy back the winning bidder's gift card at 75% of face value. The winning bidder can choose to (a) have the payment sent to the winning bidder's PayPal account, (b) receive the payment via cashier's check or money order, or (c) have the payment credited to the winning bidder's Bidding Account Balance. (a) "I want to receive my $75.00 payment via PayPal." (b) "I want to receive my $75.00 payment via cashier's check / money order (made payable to the PayPal account holder). The payment in the form of a cashier's check or money order will be mailed to the winning bidder's PayPal Confirmed Shipping Address free of charge via the United States Postal Service within approximately 48-72 hours following the winning bidder's selection of this cash option. Note that this approximate 48-72 hour processing time excludes weekends and holidays. (c) "I want the $75.00 payment credited to my Bidding Account Balance."